Gaudate et Exsultate deliberately focusses on “now”, the present, and where we are in our homes, communities, country and world today. It is a reflection on ‘the mysteries of the Beatitudes” as Bishop Marcus comments. Notably, the opening words “Rejoice and be glad” set a positive tone, announcing “good news”. The psalm for the recent feast of St Francis has the refrain “I am sure I shall see the Lord’s goodness in the land of the living” (Psalm 26) yet most of the time these days it is hard to see evidence of the Lord’s goodness in the land of the living here and now – not least if you follow the daily news media.In our Diocese of Leeds there is evidence in our society of major economic and social shifts in recent decades from traditional manufacturing to service sector and retail industries, and to part time, temporary and lower paid work , to two parents working with reducing family incomes, changes to welfare and tax support ( the introduction of universal credit), all compounding an increasing level of poverty, especially among the new ‘working poor”. There is rising homelessness and call on food banks, the filling up of the prisons, the arrival of refugees and migrants, family relationship stress and breakdown, all drowning out any sense of “the Lord’s goodness in the land of the living”. Despite this, our parishes and parishioners through individuals and organisations such as the SVP, Catholic women’s groups, and Knights are already key supporters of foodbanks and helping the homeless. The Diocesan Refugee Support Group, St Monica’s Housing, Growing Old Gracefully and Catholic Care are now well acknowledged sources of practical support. Pope Francis opens with a reminder in “Gaudete et Exsultate”; “If I encounter a person sleeping outdoors on a cold night, I can view him or her as an annoyance, an idler, an obstacle in my path, a troubling sight, a problem for politicians to sort out, or even a piece of refuse cluttering a public space. Or I can respond with faith and charity and see in this person a human being with dignity identical to my own, a creature infinitely loved by the Father, an image of God, a Christian. Can holiness somehow be understood apart from this lively recognition of the dignity of each human being” (para 98). 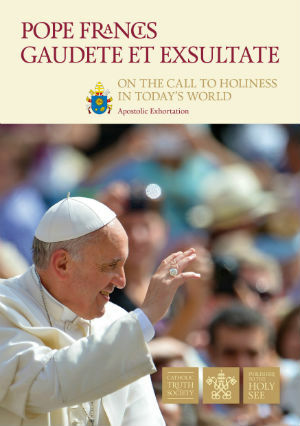 In a central passage in “Gaudete et Exsultate”, Pope Francis emphasizes that “the call to holiness” is an invitation to recognize the “face of Christ in others; Jesus clears a way to seeing two faces, that of the Father and that of our brother. He does not give us two formulas or two more commands. He gives us two faces, or better yet, one alone; the face of God reflected in so many other faces. For every one of our brothers and sisters, especially the least, the most vulnerable, the defenceless and those in need, God’s very image is found. “God is eternal newness. He impels us to constantly set out anew…. He takes us where humanity is most wounded….so if we dare to go to the fringes we will find him there; indeed he is already there. Jesus is already there in the heart of our brothers and sisters, in their wounded flesh. In their troubles, and in their profound desolation. He is already there.”(para 135). Our God is a God of surprises, calling us, daring us; “God infinitely transcends us; he is full of surprises. We are not the ones to determine when and how we will encounter him; the exact times and places of that encounter are not up to us.”. (para 41). “ It is true that the primacy belongs to our relationship with God but we cannot forget that the ultimate criterion on which our lives will be judged is what have we done for others…our worship becomes pleasing to God when we devote ourselves to living generously and allow God’s gift granted in prayer, to be shown in our concern for our brothers and sisters” (para 104).